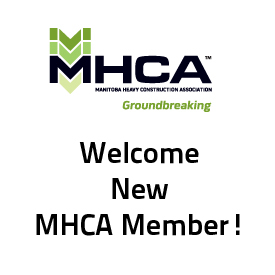 Founded in 1943, The Manitoba Heavy Construction Association (MHCA) is the recognized voice of the heavy construction industry in Manitoba. Guided by our vision and mandate, we promote sustainable municipal infrastructure development, sustained investment in core infrastructure, and seamless, multi-modal transportation systems. The MHCA also runs and supports the WORKSAFELY Education and Training program. Learn more about MHCA by reading our President’s message. Sign up to receive the Heavy News direct to your inbox each week. Winnipeg City Council’s 2019 proposed budget would eliminate all significant repair work on residential streets – 53 projects cancelled this construction season. With two portable asphalt plants (each plant producing 450 tons/hr) and related lay-down equipment, the Ledcor team is accustomed to working with end-product specifications. They provide expertise in – grading, aggregate production, granular base course placement, paving, bridge construction and steel structures.